My first memory of the quail goes back to 2002 when a group of us friends went to the 'Grand Taj' restaurant in Shivajinagar, Bangalore for some good biriyani and kebabs. The special of the day happened to be a quail preparation we were all eager to try. As none of us had tried the bird before it was one of those "first time" experiences. The bird was deep fried and served whole on a bed of thinly sliced onion rings, with a sprinkling of black salt. 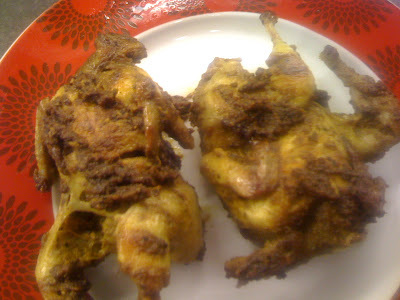 It appeared like a miniature version of the chicken but tasted far superior, the preparation was delectable. The next time I tried this bird was at 'Annachi' in Indiranagar, Bangalore. We ordered the 'Teter 65'. The bird was served deep fried and crispy on the outside and soft in the center, served with a sprinkling of chaat masala powder, fried curry leaves and fresh lime wedges. It was super tasty and unforgettable. Whenever hubby and me travel home, we make it a point to have the quail as it is one of those meats we miss in the UK. Suprisingly, the other day on our weekly grocery shopping trip at our local supermarket we came across the quails. Wonder of all wonders........we were chuffed and overjoyed. Brought them home, marinated them in a spicy pepper mixture and couldnt wait to cook them. The same evening i shallow fried the birds in olive oil and served them with steamed american corn on the cobs and fresh leaf salad......the end result.............a heap of bones and a feeling of satiety!!! 1. Once both the quails have been cleaned, flatten the birds by cutting through the back bone. Make slits all over the bird to allow the marinade to penetrate the meat. 2. 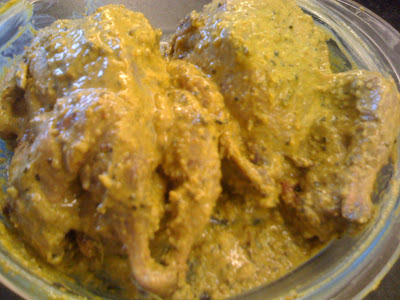 Mix all the marinade ingredients together and apply to quails liberally. Allow the birds to marinate for a minimum of 3 hours. 3. In a pan take 2 tbsps olive oil and fry the birds all over for a few mins. Then add 1/2 a cup of water reduce the heat, close the pan and allow the bird to cook for 25 mins turning in between. Add more water in between if needed. Once the bird has cooked allow all the water to dry up and the skin to brown by increasing the flame. Serve hot. Food Fact: The Japanese Quail is also known as the 'Pharoah's Quail', 'Stubble Quail' or Eastern Quail'. It is a species of quail found in East Asia. In Japan, they were kept as pets beginning the eleventh century, however by 1910 they became popular for its meat and eggs and are now categorised as game birds. 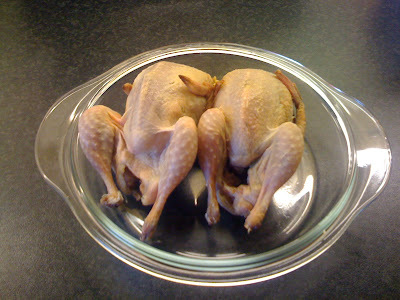 The breast, legs and eggs of the bird are considered a delicacy. The most effective way of getting the best flavour of the bird is by roasting or frying it. This bird is a good source of Thiamin, Riboflavin, Iron, Phosphorus, Zinc and Copper, and a very good source of Protein, Niacin, Vitamin B6 and Selenium, however its meat is high in Cholesterol. Wow! Thanks for the recipe! We come across quail meat in the supermarkets in Qatar but were not sure if it would work for us. The recipe looks great and am sure it would taste great too, the only thing that would hold me back is the cholesterol content part. Is the texture of the meat the same as that of chicken? The recipe looks simple and the results look great! Is the texture of the meat the same as that of chicken?